It’s back to the 1990’s for Marvel Studios’ CAPTAIN MARVEL where we learn how Carol Danvers (Brie Larson) transforms from Air Force officer to one of the world’s mightiest superheroes. Set in the 1990’s Marvel Cinematic Universe fans will see a return of familiar names including Samuel L. Jackson as Nick Fury, Clark Gregg (Agent Phil Coulson), and members of the alien race of the Kree – Ronan (Lee Pace) and Korath (Djimon Hounsou). Continue reading for more details from Marvel Studios’ press release. Take a look at the characters for CAPTAIN MARVEL, and the one that’s getting all the attention is… Goose! However, there’s more to this orange tabby cat than meets the eye. Now, strike a superhero pose! Tickets on sale now for CAPTAIN MARVEL. She looks pretty good in grunge, in this special look at the film. First trailer, poster, and official images released for CAPTAIN MARVEL, love the 90’s vibe with Blockbuster Video, Nine Inch Nails, Starforce, the Skrull, and behind-the-scenes photos. Take a look below. Marvel Studios has begun principal photography in Los Angeles, California, on its newest film, CAPTAIN MARVEL. The production is shooting in and around the greater Los Angeles area, which will also serve as the production base for the film. The production will also shoot on location in Fresno, California, as well as locations in Louisiana, including Baton Rouge and New Orleans. 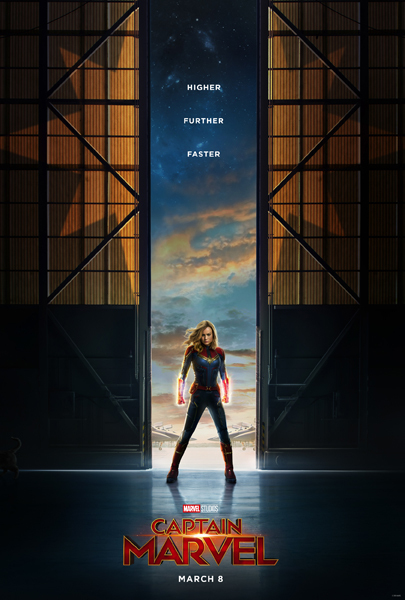 Set for release in the United States on March 8, 2019, Marvel Studios’ CAPTAIN MARVEL is directed by the writing/directing team of Anna Boden and Ryan Fleck, whose credits include “Mississippi Grind” and “Half Nelson.” An all-star collective of accomplished writers penned the screenplay, including Meg LeFauve (“Inside Out,” “The Good Dinosaur”), Nicole Perlman (upcoming “First Man,” Marvel Studios’ “Guardians of the Galaxy”), Geneva Robertson-Dworet (“Tomb Raider,” upcoming “Sherlock Holmes 3”), Liz Flahive & Carly Mensch (“Glow”), and Anna Boden & Ryan Fleck. With the release of BLACK PANTHER in February, Marvel Studios continued its unprecedented success. At the time of release, the film recorded the second biggest opening weekend of all time with $202 million and is on track to the become the highest grossing superhero film at the domestic box office. The film has grossed over $1.1 billion worldwide to date. “Black Panther” propelled the Marvel brand’s #1 domestic box-office opening streak to a record-breaking 19 consecutive films.